Since the early 2000s, Russia invests heavily in what has come to be seen as oil-based geopolitical foreign policy. The Russian state-owned enterprise Rosneft has grown to be an internationally wielded tool of the greater geopolitical aims underlying Russian interests abroad. Increasingly, Russia has exhibited desires to increase its market presence, and hence diplomatic and political leverage, in various areas of vital importance to U.S.-based interests and strategy. Particularly, through years of strategic financial aid and investment, Russia has come to fill a crucially stabilizing role and void once held by China as the “primary banker,” in the Venezuelan market. Stemming back from the reign of Hugo Chavez, Venezuela’s now contested president Nicolas Maduro has emphasized a priority on maintaining diplomatic and financial relations with Russia. Given the tumultuous state of Venezuelan economic security as a result of the country’s political malfeasance, and the Venezuelan economy’s heavy reliance on and derivation from its liable ‘petro-state’ model, a Russian-Venezuelan partnership aptly suited the interests of both sides involved. Venezuela, incredibly dependent on the export of its oil and gas products, and lacking financial soundness indicative of the ‘resource curse’ instability of its hubristic Dutch disease economic practices, Venezuela desperately has sought outside support. Fluctuating market oil prices and heavy-handed dependence on exports have drawn Venezuela straight into the bestowing arms of Russian investment and financial provision. An integral relationship has thus developed between Russian providers and the suppliant Venezuelan economy, specifically through Russian Rosneft’s courtship of the Venezuelan state oil company, Petroleos de Venezuela S.A. or PDVSA. In 2017 Russia provided debt relief to alleviate Venezuela’s constricting financial capabilities. 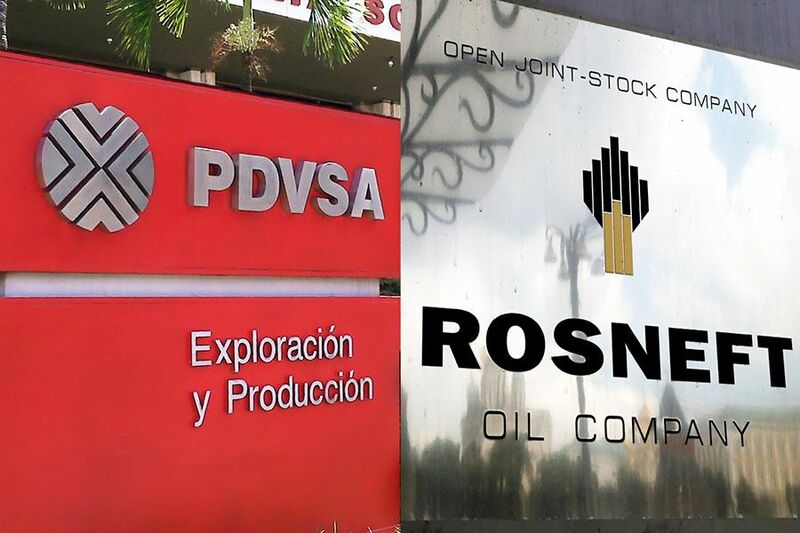 Recent analyses now purport that Rosneft has loaned upwards of $6 billion to PDVSA, yielding Russia unprecedented economic and now diplomatic leverage in the country. Economic stabilization has transcended into political stabilization of the now intransigent regime of Nicolas Maduro in Venezuela. And these favors come with the politically advantageous reality of encroaching upon America’s dictated sphere of influence in the Western hemisphere and over Latin American affairs. This age-old stalemate between East and West comes to prominence in light of Venezuela’s current presidential debacle. Russia has denounced the American-backed figure of Juan Guaidó as the Venezuelan president, insisting that incumbent Nicolas Maduro is the legitimate leader of the country. Moreover, Russia has decried American sanctions aimed at the Venezuelan oil industry, of which Russia is now a key stakeholder, labeling the actions as a furthering of American commercial imperialism in Latin America. Russia’s engagement and increasingly passive belligerence with the U.S. in Venezuela builds upon mounting geopolitical signals of Russian presence in the region, stemming from Russian bombers sent to Venezuela in December to a recent Russian passenger jet landing in Venezuela direct from Moscow. The future of Russia’s role in the West remains to be seen, as political developments continue to unfold.